The team investigates a body found in a car crash, and the remains belong to a founder of a men’s rights organization who may have been the victim of domestic abuse. 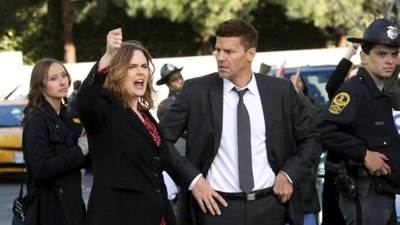 As Brennan learns more about the tenets of the victim’s organization, which claims middle-aged white men are oppressed and feminists are man-haters, Brennan uncharacteristically loses her cool during an interrogation and assaults the organization’s co-founder. Meanwhile, Angela and the team struggle to deal with Hodgins’ post-wheelchair bitterness and Booth is convinced Brennan is a jinx for the Philadelphia Flyers.